The Argiope aurantia is without a doubt one of the most hauntingly beautiful of garden creatures. If Picasso were to have painted a spider, she could have been his inspiration. Her large size makes her one of the most intimidating spiders in North America. Although she looks imposing, she’s beneficial, non-aggressive and non-poisonous. She graces our gardens with her unique beauty and her voracious appetite for grasshoppers and other garden pests make her a welcome addition to most landscapes. She is known by many common names: Black and Yellow Argiope, Yellow Garden Spider, Writing Spider and Scribbler are just a few. 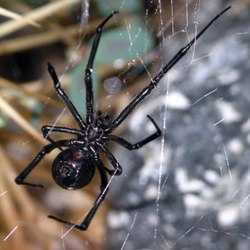 The last two common names describe the decorative zig-zag she works into the center of her web. Although she's been hanging out in the garden all summer, it seems that she's noticed more in the fall when she is gravid with eggs, which adds to her impressive size. Readers paying attention will note that I’m addressing her with a feminine descriptive. That is because all of the large, colorful spiders in these webs are ladies. She builds her web and stakes out her claim to a section of the garden. The tiny male suitors come courting, only to have their one moment of passion, ultimately to become dinner. Occasionally, one may see a diminutive male clinging to a corner of the female’s web, waiting until she feels romantic, not knowing that he’s ultimately doomed. The female will then lay between 300 and 1400 eggs and protect them with a tan covering shaped like a large marble or ping-pong ball. She attaches it to a corner of her web and can have as many as three or four of these cases in a season. The spiderlings hatch in the fall, but will remain dormant in the protective case until spring. When they emerge, predators will hastily consume all but the quickest of the babies, so very few actually make it to maturity. Technically, a spider is not an insect. The Argiope aurantia, along with all spiders, are of the Arachnida Class. She is of the Order Araneae and the Family Araneidae. 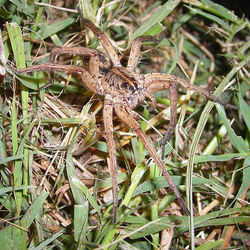 Spiders have eight legs, as opposed to the six that insects have. As a confirmed Arachnophobe, I tend to beat a hasty retreat when confronted with an eight-legged interloper, but I’ve made my peace with the Argiopes and have actually come to enjoy their presence in my garden. A great number of gardeners have had the honor of having the Argiope aurantia take up residence in their plantings, as the many entries in BugFiles attest. She is easily one of the most photographed creatures in the whole database. Her range is wide and she can be found in many places and climates. 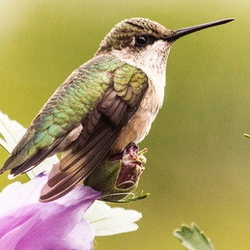 From Southern Canada, throughout the lower Forty Eight, Mexico and Central America to Costa Rica, she lives in sunny gardens, city balconies, shady forests, urban lots and swampy wetlands. About the only areas where she’s hard to find would be the Rocky Mountains, arid deserts and the Canadian Great Basin. In climates where it does not freeze, she can even live several years, but as fall comes and frosts occur further north, she only lives one year. Many people have actually named these colorful gals and helped them along by tossing them grasshoppers, stinkbugs or other garden pests. I’ve read blogs on the Web, (no pun intended) about Argiopes named Agatha, Isabel and Charlotte. Although the real 'Charlotte' was not an Argiope aurantia, she was an Araneus cavaticus. The scribble down the center of the Argiope’s web may have contributed to the idea for the book. My Argiopes are all named Cindy. Since childhood, I’ve had the honor of having a 'Cindy' live in my garden each year. It makes no difference if I have one or twenty, they are all Cindys at my house. People automatically assume that a creature that looks as threatening as the Argiope aurantia would surely be aggressive or her bite would be deadly. They run immediately for the nearest weapon and send her to an early demise. While she can bite, she rarely does and the effect is no more uncomfortable than any other non-poisonous insect or creature. The area may be red and itchy for a week or so, but no lasting harm will result. When her web is threatened, she will sometimes bounce like she’s on a trampoline, which must be an attempt to scare off the potential intruder. If this tactic fails to achieve the desired retreat, she will turn coward and scurry to a corner of her web, or under some foliage, until she deems it safe to return to her customary head down position in the center of her domain. She’s a particular housekeeper and tends her web with such care and diligence, that one could almost think she takes pride in her creation. She’s an artist who spins a new masterpiece every night, eating the old web in an ultimate act of sustainability. Graceful and beautiful, the Argiope aurantia decorates my gardens. Her presence lets me know that my landscape is a living, breathing entity. 'Cindy' brings balance and stability to her world and by the same token, into mine as well. It is my hope, that gardeners who may have automatically considered her dangerous, will step back and reconsider. Colorful as a child’s crayon drawing, she almost glows with intensity.